The temperature impacts energy pricing. 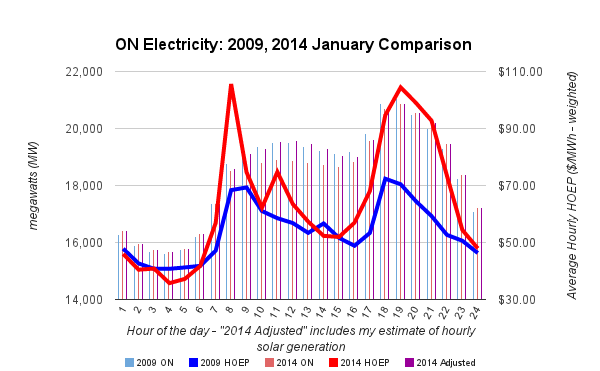 Ontario's electricity system operator shows an average Hourly Ontario Energy Price (HOEP) of $65.43 per megawatt-hour (MWh) - which is the highest it has been since 2005, although well below the ~$89/MWh (8.9 cents/kWh) that regulated price plan consumers will average. A couple of entries on the "Ontario Network for Sustainable Energy Policy" blog (parts 1 and 2), dealing with temperature and price caught my attention this week; the first of which concluded observations "stimulate further discussion about the drivers of Ontario’s electricity system, "which can then feed into conservation and demand management discussions...and about sustainable energy service provision in this province more broadly." I'll analyse based on two months with comparable demand data; comparing two similar demand periods migh communicate more about the impacts of supply and pricing changes. This being Canada, it doesn't seem that surprising that January provides the majority of the highest demand months over the past decades. The big changes in pricing come during the early morning hours, and the evening peak. This is one month of data, and the month was exceptional in adjacent markets setting pricing on a number of occasions, but this peakiness in pricing for the morning and evening demand ramps is something to watch. Coal generation, eliminated in most of the province as of 2014, did provide superior peaking depth, and the absence of coal-fired generators may result in more price spikes. When including an estimated production from solar panels , the conclusions about market changes must change significantly. The following graph shows only the changes from 2009 to 2013. Adjusted with estimated embedded solar panel generation, the changes in daily consumption patterns looks very different. TOU pricing policy has actually shifted use to the highest demand period of the day, with a corresponding jump in wholesale market rates during hours 19-22. It's expected that winter demand see a dual peak, at least for pricing - with the morning ramp up in demand presenting a challenge, and the increased demand of lighting and cooking, as well as heating, coming after nightfall. But looking at the extent of the change in hourly pricing between 2009 and 2013, it would not be implausible to suggest the system operator is surprised each day by excessive supply, or lax demand, during the sunlight hours. With a brief exception mid-morning, the price pressures at sunrise and sunset surround a price change curve inversely matched to changes in solar output. Looking at pricing the solar data may surprise many; solar output, in winter, has only average value to the market. While that's far better than it's cousin, wind energy, I'm not sure many informed people would choose to spend 6.5 times more contracting intermittent supply providing a product of average value. 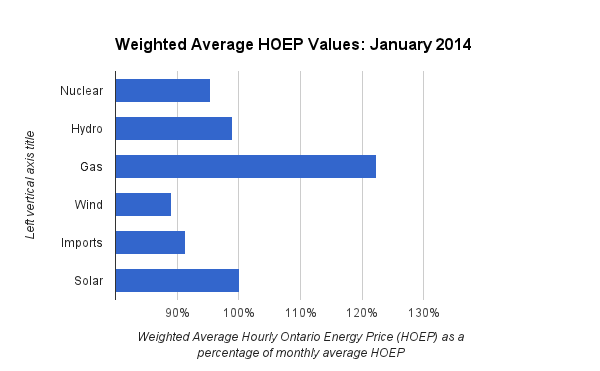 Known ways for the HOEP to rise are an escalation in fuel (natural gas) pricing, and export markets setting the price. In January 2014 both were, at times true. The beginning of this blog entry noted an evaluation of weather and electricity demand opining it might be valuable in "conservation and demand management discussions...and about sustainable energy service provision in this province more broadly." Highly unlikely. A useful discussion about sustainable energy would note Ontario is only procuring product (wind and solar) which the market values least. Demand does not set price except as part of the supply and demand relationship; supply that has no capacity value can only reduce prices when it produces. Demand management pricing strategies were, for winter, essentially, abandoned in 2011. TOU is a plaything now - and that is likely a good thing. Ontarians pay for the system and it's not surprising they don't particularly feel like apologizing for eating warm suppers. It's the highest demand month in 5 years and not only did Ontario meet it's demand needs, it exported heavily during higher price hours; January 2014 was aan exceptional month in that the average weighted HOEP for exports was higher than the average weighted price for Ontario's demand. I doubt any particular lessons could be drawn from our cold January in 2014, but looking back to the last month of even greater demand might be instructive. January 2009 likely had cold temperatures lead to deeper freezing, more snow and a later freshet during more temperate spring hours when surplus generation can be exceptionally problematic. Despite January's high demand, 2009 ended with the lowest total electricity consumption since 1997. Not sure what lessons could be drawn from a comparable month to start 2014. 1 The IESO has a .csv file indicating "Demand prior to market opening was derived from operational meters." So data up to May 2002 is actually demand data, but after the market opened what the system operator (now called the IESO) reports is not demand, but the supply on it's grid. This should have been greater than the meter data figures in the early years of the market, as line loss likely exceeded the amount of generation "embedded" within local distribution companies (LDC's). 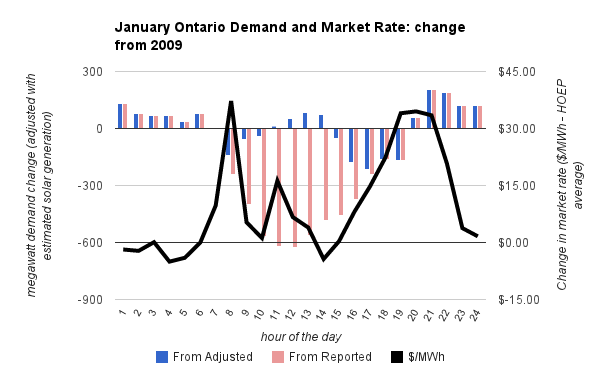 As most solar generation, and some other newer supply, is embedded, the IESO's "Ontario Demand" would have been coming back to "metered" demand levels up to about a year ago, when demand reported by the IESO likely transitioned to being less than actual metered demand. 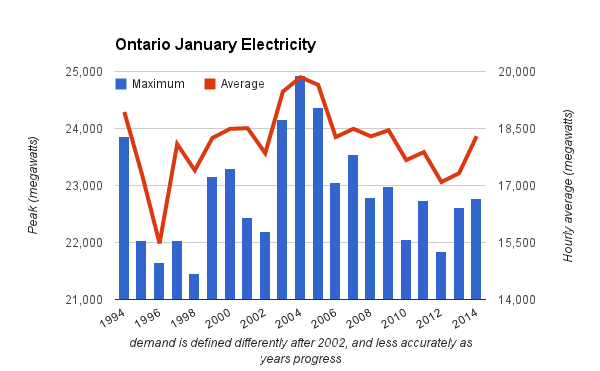 To complicate that, the IESO has also changed how it calculates the supply included in it's "ontario demand" -so the data quality is declining, but overall the trend shown is still likely reflective of reality. 2. As defined by the IESO - see endnote 1! 3. Time-of'-use hours changed prior to the general election of 2011, in order to move dinner hour to off-peak from on-peak for purely political reasons. I'd suggest TOU is not a sensible policy regardless - so it's pricing will always be set politically. 4. Embedded in local distribution networks, current solar capacity does not show as "demand" in IESO reporting - instead it would impact figures by reducing demand. 5. The exception being the Class A customers who have worked the system assuming (likely correctly) the HOEP will be so low most charges will be from the global adjustment mechanism. Most residential, and some business customers, will be on regulated price plan rates, and those rates are higher than a year ago. However, the regulated price plan rates are forecasts of the average class B rate for a 6-month period. (adjustted for existing variance pools). Class B rates will not rise perceptively for January - but they did in November and December and will likely resume their upward trend once the cold weather leaves.